Amy Fielder has moved to a small town in the middle of Massachusetts to start a new life. 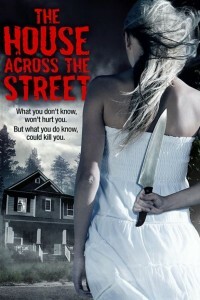 Soon after she settles into her a new apartment, she notices strange things happening at the house across the street. Always a curious girl, Amy is compelled to investigate further. The more she finds out, the closer she gets to the center of a horrific conspiracy that threatens to tear apart her new town and destroy the lives of its people. Amy soon learns the hard way that what you don’t know won’t hurt you, but what you do know could kill you. The low budget movie The House Across The Street, filmed in 2012, receives a limited theatrical release (one theater in NYC and one theater in Los Angeles), same day as VOD (Video On Demand) release.